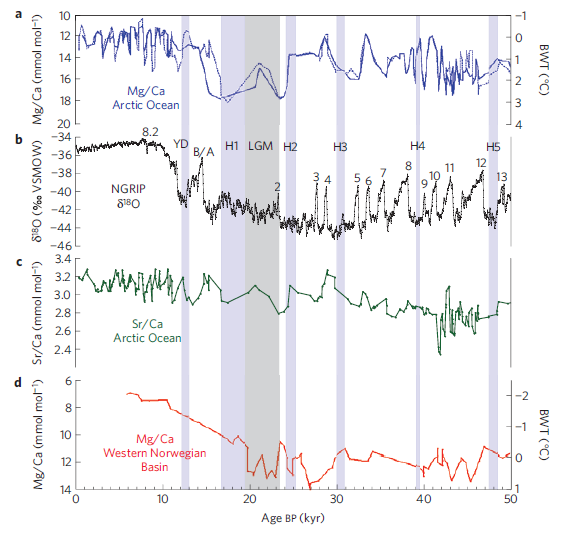 New paper finds deep Arctic Ocean from 50,000 to 11,000 years ago was 1–2°C warmer than modern temperatures | Watts Up With That? A new paper published in Nature Geoscience finds “From about 50,000 to 11,000 years ago, the central Arctic Basin from 1,000 to 2,500 meters deep was … 1–2°C warmer than modern Arctic Intermediate Water.” This finding is particularly surprising because it occurred during the last major ice age. Question could the warming come from underwater volcano’s? There has to be some accountable mechanism for bringing this rock out of ice ages. Interesting. Perhaps the real cause of increased summer ice melt is the reduction in cold fresh water reaching the Arctic Ocean following the damming and diversion of many large rivers in North America and North Asia for agriculture. Viola, Trenberth’s missing heat. Flip the axis upside down aka Mann and the Tijlander series and everything becomes clear. The missing heat is trapped in the past. Looking at the last ice age glaciation pattern, I can’t help but wonder if the Clovis comet strike shifted the pole from northern Greenland to the middle of the Arctic Ocean. Prior to 11K years ago, this would have put most of the arctic waters further south along with Alaska and Siberian steps to support the mega fauna where they couldn’t have survived today. This study supports that concept. I would look at incoming Arctic currents as the source. If oscillations of trade winds were in the La Nina-like mode in either the Atlantic or Pacific equatorial region for some period of time, this extended season of ocean warming would ride the currents into the Arctic. It may have been the beginning of the end of the glacial cover over the NH. I recall some articles on cyclical current shifts taking water from northern Russian rivers in different directions. Under some current conditions, that fresh water moves east toward the Berring Strait which is a natural chokepoint keeping fresher water in the Arctic making ice formation a lot easier. In the current conditions, that water is flowing west toward the North Atlantic where it disperses more easily and is a smaller influence on a much larger body of water. This is a interesting find. If this finding pans out, I wonder what its relationship to the Beringia refugia was? BTW, and some think we understand climate well enough to predict what the moderate increase in the level of a trace gas will have! As this occurred during an ice age, presumably there would have been rather more (i.e. thicker) ice on the surface than we’re used to. Assuming that the warmth probably originated, then as now, from undersea volcanoes, could it just be basically a case of better ‘insulation’ preventing it from escaping? When there is ice on top, it stops the heat underneath escaping. This would suggest that there could be a compensating effect to the loss of albedo arising from less ice. Is this statement purely based on their model? So we are back to “Two Days Before the Day after Tomorrow?” The paper apparently says the warmth is generated by a saltier ocean (less fresh water flows when it is turning into glaciers). An increase in salinity is an increase in density. Temperature will increase to compensate for the density change. The depth will also change where this transition happens. This finding is particularly surprising because it occurred during the last major ice age. Inflow of warm heavier salty water from the N. Atlantic’s currents would circulate at some depth below lighter fresh water, while totally frozen surface would prevent any mixing due to tides or storms above; thermo-haline circulation had ideal conditions. This above seminar says warmer intermediate layers are responsible for less sea ice in 2007, 2008. The new paper says warmer intermediate layers are seen right before very cold periods. Note this graph is on an inverse scale with warmer temps at the bottom and colder temps at the top. However, plot B is of delta-18O where the warmer temperatures are on top. Somehow, I can’t grasp what is being said here, I guess. I thought the laws of thermodynamics sort of required heat to flow from where it is to where it is not. This sort of makes me think that if I could make my attic colder, my floor would be warmer. I don’t quite follow the modeling that makes this work, but I have seen so many “computer models” that leave me breathless that I guess this could just be another one like them. I find it fascinating that science now “knows” facts from so many thousands of years ago by modeling, and interpreting those models. I guess that is one of the driving engines behind “knowing” climate change as well. And as we observed this past melt season when the ice is thin storms can induce mixing of the warmer saltier water to the surface where it really does a nice job of melting the ice. All you have to do is look at bouy data to see the large disturbances the storm caused in the vertical structure of the ocean column. it’s not surprising that deeper water would be warmer during that period. no open surface no chance to see what we witnessed this season. Not sure why people think this is surpising. maybe cause the read the word ‘warmer’ and didnt follow what happened during this past storm to the vertical structure. of course, before the storm hit people at nevens were already explaining what would happen. and, yup, they were right. ekman pumping. cool stuff. amazing what you can learn if you keep an open mind. here of course people argued that there would not be a storm. argued that it would have no effect and argued that it was common.. then, of course, they changed their minds about all of that. now they argue that the storm was rare and that all the ice disappeared because of it. go figure. “here of course people argued that there would not be a storm. argued that it would have no effect and argued that it was common.. then, of course, they changed their minds about all of that. A grammar lesson in “their”, at least. Go figure. Let me correct Steven’s comment: some people argued some things. But cherry-picking their comments, and then implying that their position is the same as all WUWT readers is a fallacious argument. Also, the tropical storm/hurricane was a pretty mild one as these things go. The fact that there was landfall resulted in a lot of frantic arm-waving by Chicken Littles. But in reality it was no big deal. Solar salt water ponds were develop in the early 80’s by some Israelis, looking at natural formations at hot springs, I believe. The idea is that if you have increasing salinity with depth (usually in steps) you can maintain at the bottom a much hotter body of water than at the top, somewhat contradicting the axiom that hot water rises. By putting these stratified salty layers into a pond with the bottom painted black, solar heat warms the lowest layer, to quite high temperatures like 60 C.
The process of placing salty water from the Atlantic under the cooler water above, with different quantities of water for both, can lead to unexpected warmth trapped at depth. Disturbing the carefully balanced layers could cause what can be termed disruptive mixing which allows the structure to progressively collapse across a whole region. The result would be a sudden (faster than usual) melting of ice from the untrapping of the heat, followed by a lower than average temperature throughout the water column (because the heat is lost more efficiently from the warmer surface). To have a 1-2 degree difference over sugh a depth would be easy if the water is slightly saltier (denser). That heat is not collected locally of course, it is imported. Not sure if it’s possible, but it would be very helpful to have a better image of the chart. that one is so blurry, it cannot be read. You should know that scientists know everything. I mean have you ever heard the expression “scientists were amazed to discover”. I thought not. Looking at the last ice age glaciation pattern, I can’t help but wonder if the Clovis comet strike shifted the pole from northern Greenland to the middle of the Arctic Ocean. The proposed Clovis comet would have had the energy to shift the earth’s tilt about, umm, close to zero, give or take a couple thousandths of a degree. Not really surprising. Sea ice is an insulator. The Earth has a net heat loss from the Arctic. Increase the sea ice and less heat is lost. This confirms that increased snowfall and snow accumulation on land causes the glacial phases of ice ages. The metric to watch is NH winter snowfall, which has increased about 20% over the last decade. First there was the perfectly shaped hockey stick of atmospheric CO2 concentrations. Then the perfectly shaped hockey stick of increasing temperature. The pair made the perfect bookend match for my collection of authorative climate texts….UNTIL….A W Montford put some unsightly MWP and LIA bumps in the handle and chopped of the curved blade fo the temperature hockey stick. THEN….Z Jaworowski put lumps in the CO2 hockey stick with analysis of ICE CORE anamolies, including many during the Arctic time period mentioned above. [see http://www.DetectingDesign.com/ancientice.html%5D While bundling the now worthless climate texts i did notice a THIRD hockey stick bookend, that of government funding on “CO2 endangerment findings” over the last one hundred years. This stick was flat at 2 million per year until big Bush in 1988, when it suddenedly ramped up to over $100 billion per year. “When all you fund is findings for danger…danger is all you will find”. MUST SELL….no offer refused. just click watch now, enter you edress an watch that film. Hey when Mosher agrees with Vuk ‘interesting time’ must be upon us! Re: this summer rapid melt of the Arctic sea ice. I assume Steven could say it is sign of global warming, CO2 etc, etc, etc; that is where we shall disagree strongly. it shows that in March-August this year cumulative strength of geomagnetic storms were a 30-40% stronger than in 2011. Single storm of a medium strength pack as much energy as M6 earthquake, but that is not all. Speculative? Yes. Likely? Maybe not, but I prefer it to the CO2 back radiation. @Billy Liar and F. Ross. From reading Warmista sites I thought it was “WallAAH” and that my years of French scholarship were wasted. As for the pedanticism, pedantry, pedantism, whichever you prefer; I resist commenting until the one hundred and tenth instance of gross misuse that I find and so post not more than three or four times a day. Trying not to spoil the fun. I blame Groucho Marx for this, “viola” is Groucho’s feigned sophistication. I use “viola” in the comedic sense. As Groucho did. Way back in the 1990s I saw a long presentation by a geologist that included millions of years of estimated temperature data, with a focus on the last few hundred thousand. “Like when I was a kid” is so far beyond utterly meaningless when it comes to climate that I can’t help but see millions of panicked “scientists” and policy wonks as just a *little* nutty because of it. One wouldn’t think comet ice balls would have any impact if looking at their mass only but if one thinks in terms of energy they released and how much mega tons of ice they blew south from the north America ice sheet (creation of the Carolina bays come to mind) then it is conceivable that if could change the tilt of rotation since we are a spinning ball in a vacuum. I sure someone can run the numbers to see how much mass displacement would be needed for such a shift. I threw the ideal out for consideration as it would answer some questions that have bothered me for a while. This would explain why lands that supported large populations of mega fauna during the height of the last ice age are now frozen wastelands during the warmer interglacial age. Why the magnetic pole is moving northward as if it is trying to catch up with the new center of rotation. Maybe the new center of rotation has changed the distribution of ice/snow accumulation needed to create the next ice age which is overdue by many estimates. The word is actually spelled “Vidalia”… a sour, big-headed life form that thinks its really green but mostly just has its head stuck in the dirt. The magnetic north really doesn’t care where the center of rotation is. Its based on precession, magnetism and the moon. Just like the physical north is based on precession, gravity and the moon. Magnetic north can respond more quickly to such inputs because it is generated by a mass less effected by inertia and gravity. I don’t want to sound pedantic, but sometimes I wish we could be more consistent and precise with terminology regarding ice ages, and not use the term interchangeably with glaciation periods within ice ages. It gets confusing if you start referring to interglacials as non-ice ages because the time scales are hugely different. An interglacial period, like the one we are in, lasts a few thousand years (10-15 thousand) A non-ice age lasts tens or even hundreds of millions of years. This comes as a surprise to many people but the fact is we ARE inside an ice age (also called the quaternary glaciation) which started about 2.5 million years ago. And we will be in an ice age as long as there are continental ice sheets in Antarctica (and Greenland). So those measurements going from 50,000 to 11,000 years ago took place mostly in the last glaciation period within the *current* ice age, before the current interglacial. Previous ice ages are the Huronian, which started about 2500 million years ago and lasted some 300 million years. Then comes the Cryogenian about 700 million years ago that produced the snowball earth for a while. It lasted some 150 million years. Then came the Andean-Saharan about 450 my ago, lasting some 30 million years. And then the Karoo about 350 mya lasting for about 100 my. This means that the entire globe was totally ice free from pole to pole for more nearly 90% of its existence. None-ice ages are the rule, even if the next one may be millions of years away. If I wanted to worry about something related to climate, I would worry about what we are going to do when the current interglacial, which is already some 12,000 years old, comes to an end. Going by the last 4 cycles during the last half million years or so, this should start happening relatively “soon” and it could be as soon as a few hundred years. THAT is the real challenge for the future. Is it possible that an increase in insolation caused by the milankovic cycle heated the waters which flowed into the arctic? Pedantic? That was a great education! Thankyou! I think their intermediate water temperatures are inferred from the model. The study is about benthic (bottom) forams from drill cores of bottom sediments. I’m not sure of many things but I am also not sure freshwater runoff is less during glacial maxima. The western US was pretty much a freshwater lake at the LGM. Perhaps as more CO2 molecules radiate more photons to space, more ice yields more meltwater? I wonder sometimes if peak northern hemisphere glaciation might have occurred with an ice free arctic ocean. If Tropical currents were to somehow diverted to high arctic latitudes I would think the additional evaporation could cause huge amounts Of snowfall to accumulate on the shores of the arctic. It wouldn’t even need to be that cold, in fact a bit warmer might have generated even more snow. With the arctic ocean icebound, it doesn’t seem possible to generate enough precipitation to start a continental ice sheet. Thanks for the ice age recap. An interesting aside is the atmospheric concentration of CO2 that prevailed during these ice ages. O – I forgot, according to the new AGW reality, this is all wrong, CO2 concentration has always been the “pre-industrial” 280 ppm, before the satanic industry of evil enemy-of-the-people humans came along. or less, depending whether you’re standing upside down or not, which might account for the sudden rush of blood to the head of some. I’m off to the refrigerator to consult the ice cube tray for a definitive answer as to whether I’ll need the brolly and raincoat tomorrow. No voodoo tea-leaves for this man of science buster. Yes, generally much higher than today, though maybe the Karoo was similar to today, at least according to the usual Scotese chart that you can see here http://www.geocraft.com/WVFossils/Carboniferous_climate.html though of course the uncertainties here are very large. Within geological time, non-ice ages seem to be the norm (about 90% of the time) and ice ages are the exception. But within ice ages (at least the current one) glacial periods are the norm (about 90% of the time) and interglacials are the exception. Not much we can do about that coming glaciation, except try to prepare for it the best we can. Instead, they talk about carbon credits to save us from a mythical global roasting, pestilences, hurricanes, earthquakes, whatever. It’s really an amazing case of collective hallucination induced by persistent propaganda. So we’re supposed to believe someone – some academic ‘genius’ – can tell us what the temperature of water deep in the Atlantic Ocean was, 11k to 50k before today? Is this bunch any more likely to be honest than are their fellow ‘scientists’ whose frauds are well-established? Besides, how in the name of a name can anyone possibly know – as contrasted with guess (estimate etc = guess) – such a thing? Seems to me to be identical with publications which casually mention the population of – e.g. – American bison prior to the arrival of white people in North America. My dunce cap fell off and I apologize for intruding. Papers like this make me realize how simple the Earth’s climate system is, and how easy it is to model.